Sounds pretty modifiable, can’t wait to try! I’m going to make this tomorrow. Looks so good. Rosa! It’s so good to hear from you today! I lost track of you. I miss seeing your wonderful art work and reading your stories. I just visited your blog to follow again. I think I may need to use google translate. :) Thank you so much for stopping in and leaving me a message. It made my day. :) Yes he is! Both an Eiffel Tower and eating my cooking. Well, he’s built more like a brick house than the Eiffel Tower. I just took a good look around at your blog and your paintings and now I feel so inspired. I really love how you paint a story and leave it up for interpretation. I love your work and so glad to have found you again. Yum! Yum! Yum!! Chilaquiles are my FAVORITE Mexican breakfast :) YUM!! OHHHH my! This is how I like to eat! I’ve been meaning to make chilaquiles for a long time. I love your bowl, the egg, everything about this. I also love that it’s fewer tortillas and more chicken. I LOVE this! xo I’m totally doing this. Thank you Amanda! It’s so true that we love the same foods. :) Hope you are having beautiful spring weather like we are. The sky finally opened up and we’re expecting 80 this weekend! Enjoy your weekend! Great inspiration. Hopefully I will get a great crop of tomatillos this season. Beautiful blog. Can’t wait to try! Sounds really good!! I’ve never tasted tomatillos, in fact I’ve never even seen them. Nice to know they are tart like green tomatoes which are in the markets now. Mexican food is hot here right now but the raw ingredients have been slow to hit the supermarket shelves, slowly we’re catching up. This looks delicious! You have inspired me to make chilaquiles for the first time. Would you go with roasting or grilling the veggies, the first time I make it? It looks like both gave you great results. I wish I could Janet…and I would! You are working on farms?! Animal or food? Sounds lovely. Once a week, the class I teach farms for the day. We tend topgallants and animals, learn about the sol, etc. It’s lots of fun, but it can be in the middle of nowhere. It was interesting to read that you did the recipe to ways. I agree with you that I think the chicken is moister when simmered in stock. The chilaquiles verdes looks great. Hi! I just tried to share this on Facebook, but there was no featured photo attached so it wouldn’t really shine the way it should. Looks great! Thank you so much Josette! Wonder why no featured photo. Well, you won’t believe this, but I don’t have a Facebook for the blog…maybe that’s why? I know. Way behind the times. Pathetic. Hi, I’m Holly – I don’t think it has to do with a Facebook page, just when you put photos into your blog there’s a spot for Featured photo – that becomes the photo that shows up when we “promote” your blog. 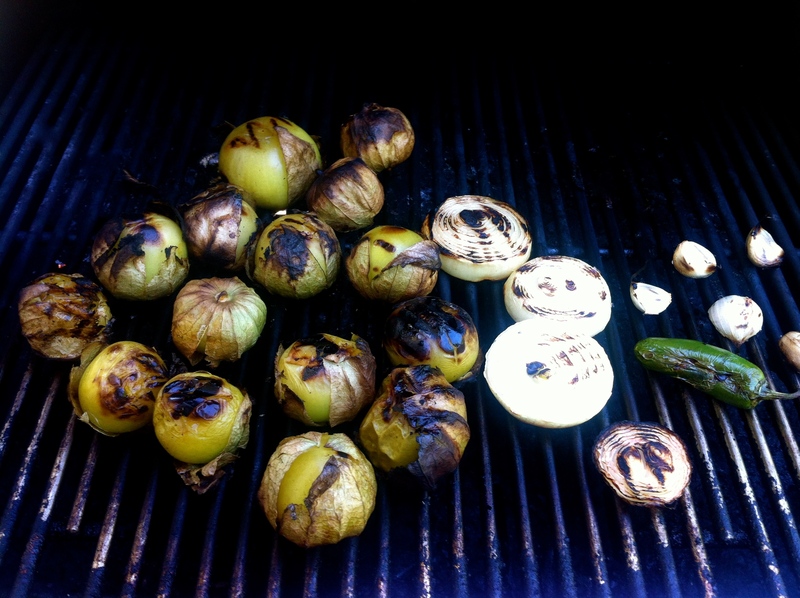 I like grilling veg but haven’t tried doing tomatillos. Will be adding that to the list! Wonder if your to do list is as lengthy as mine! And that’s just the “to cook” list! I know what you’re saying!! They really are such a cool looking fruit Seana! I remember seeing them when we lived in the USA, but never knew what to do with them… now I know! :) This sounds like it would have the most amazing flavours. Chilaquiles!! Salsa verde!! Que delicioso!! I love the veggies on the grill. And thanks to you, I now have a chimney for my charcoal Weber and cook on the coals regularly. I’ll have to hunt down some tomatillos. Great post. Wow– sauce made from scratch– this looks like an amazing dish to set on the table for brunch with friends. thanks! Yes! I think this would be a wonderful brunch with friends. I think even to whip up a batch without the chicken and serve with tortilla chips would be nice. It’s delicious! We are big Mexican food eaters. This is on my summer list… thanks Seana! Oh, I love tomatillos, and this whole dish is just fabulous!!! Great photos, too!!! 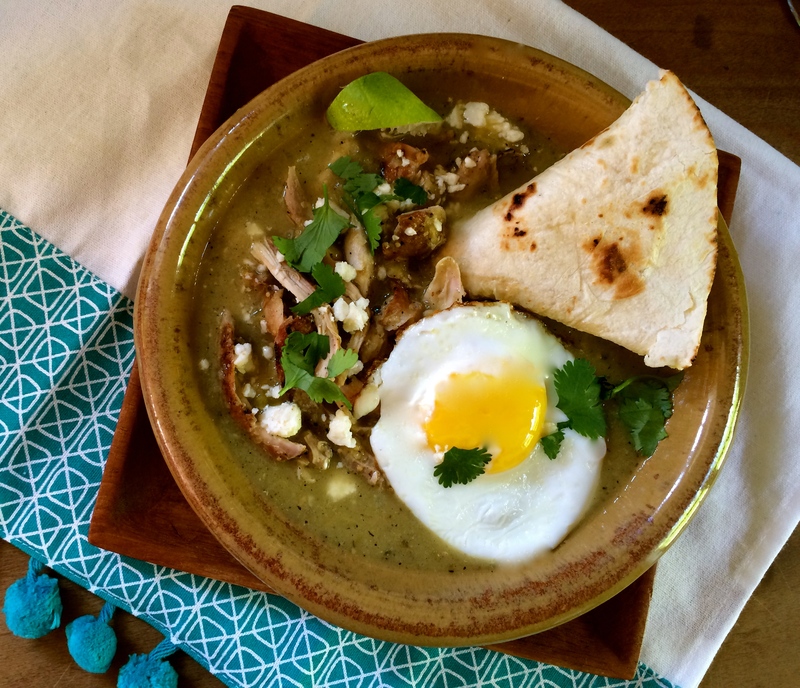 Mouth Watering delicious….saving this recipe for when our tomatillos are ready for harvest. I just ate dinner and now I’m hungry just looking at your photos! You should try! we live in portland and have a ton of tomatillos coming out on our plants! Didn’t know you lived in the PNW…such a lovely place! :) I’ve never had luck with much more than the small tomatoes here either! But our tomatillos always do well! I didn’t know you lived in Portland! :) We live in Seattle. Same…but different, right?! Totally…same but different! My parents live in seattle and my mom is always complaining about the tomatoes in the garden! It’s think it is hotter here…in fact in the mid 90’s this week! I’m all over this. It will be a couple months before I see tomatillos in the garden- and then probably not enough. They are on todays shopping list. And you can grow them here. I find them ripening a little sooner than tomatoes but generally it’s August. The little pineapple husk tomatoes-(ground cherry physalis)- are fun too. Yes! I’ve had ground cherries before, found them at the farmer’s market. Ground cherries and purslane (on the same visit), which was very interesting. I imagine ground cherries would make a nice salsa too. Great idea! Here’s a little post I put up on purslane and ground cherries. Do you have purslane growing? This looks really good Seana. Love your pompom table linen! Love reading all the beautiful ingredients – I was in seventh heaven at the stores over there. It’s so hard to find tomatillos and queso fresco here. This looks amazing! 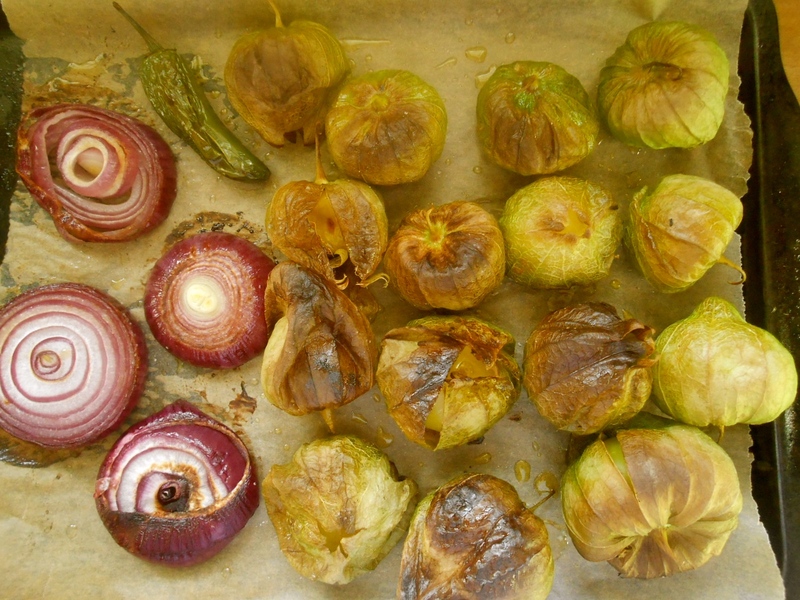 I’ve been wanting to attempt cooking with tomatillos for a long time, so this just might be the recipe that emboldens me enough to try working with them. 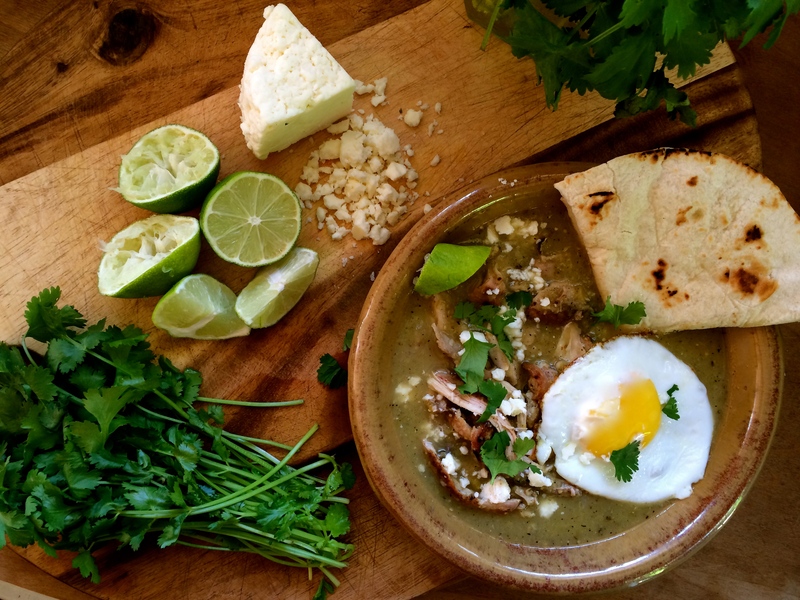 This looks and reads like wonderful comfort food – I especially love the addition of queso and a fried egg. You are currently reading chilaquiles verdes at COTTAGE GROVE HOUSE.